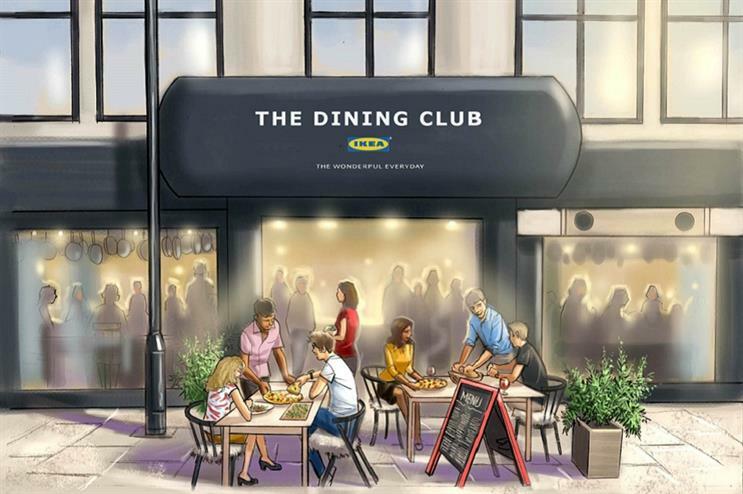 Swedish retailer Ikea is opening an immersive pop-up dining experience in London, where the diners are also the chefs. Do-it-Yourself restaurant, The Dining Club, will invite members of the public to take over the space on Shoreditch High Street to host their own dinner parties for up to 20 people and even have the diner named after them. An expert chef will be on hand to offer guidance and supervision as they prepare their meal in a homely kitchen environment, choosing from a menu including a range of modern sharing dishes as well as some Scandinavian classics. Ikea is keen to encourage people to spend more time cooking and eating together. The free experience will include food, booze and waiting staff who will also do the cleaning up afterwards so that the hosts can spend quality time with their friends. The pop-up will incorporate a ‘Food for Thought’ workshop area where interactive masterclasses will be hosted by guests including Instagram star Pixie Turner and Great British Bake Off winner Edd Kimber, an Ikea kitchen shop and a kitchen showroom where visitors can browse kitchens of various sizes and styles. Brunch, lunch or dinner slots at The Dining Club will be available from 10am to 10pm from 10 - 25 September and will be bookable online via www.ikea.co.uk/thediningclub. All visitors will leave with an Ikea treat. In June, the brand unveiled a Swedish houseboat activation on the Thames in Reading to mark the run up to its new store opening in the town. At the start of the year it hosted its first-ever gallery exhibition at The Proud Archivist in London’s Dalston.